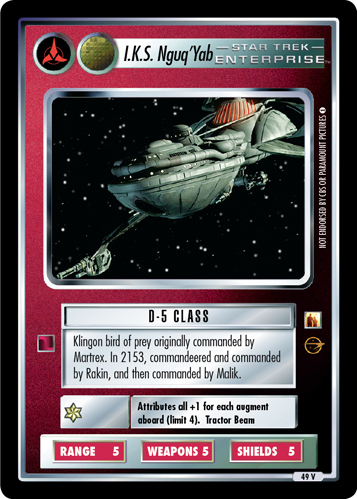 Klingon Bird-of-prey originally commanded by Martrex. In 2153, commandeered and commanded by Raakin, then commanded by Malik. Special skill(s): Attributes all +1 for each augment aboard (limit 4). Characteristics: affiliation, "affiliation", 22nd Century , Tractor Beam, Klingon ship, Bird-of-Prey.